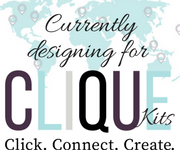 My latest projects are up on the Your Creative Wings blog today, with two layouts to share - one in a clean style and one a bit more shabby. 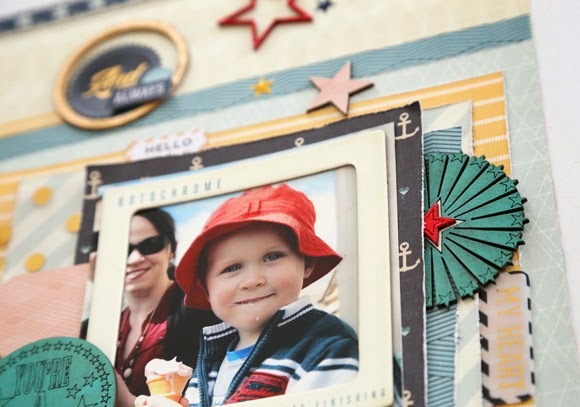 This layout is about my then four year old nephew who really deserved a special treat after being such a superstar walking around the town to show his Aunty the sights on my visit. 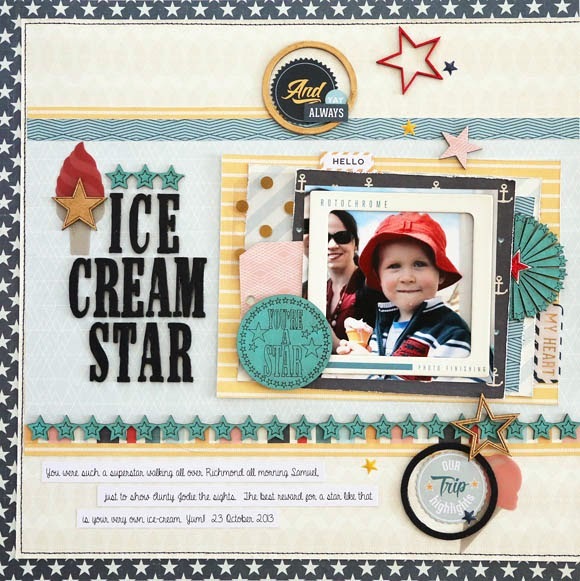 This You're A Star badge really brought the theme of the layout together for me. 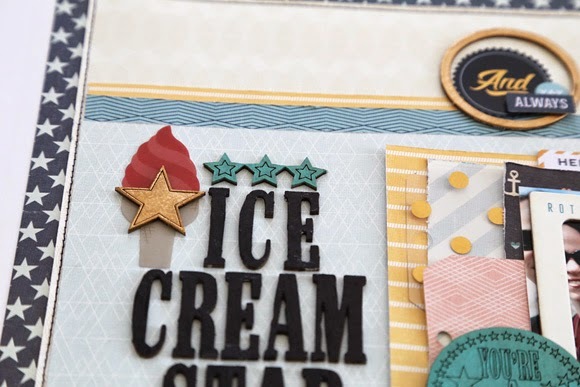 It fits so well with all the chipboard stars available in the YCW shop, and also with the Solstace collection. 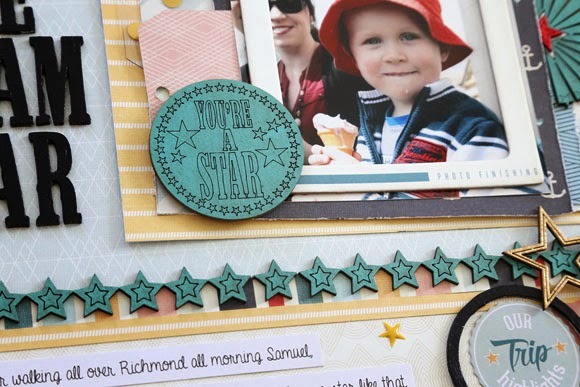 It's such a bright and cheery sentiment, can be used for both boys and girls, and even adults! I've applied pigment ink to the raw chipboard which has allowed the intricate cut details of the text and stars to keep a really nice contrast. For my title I used the Alpha #1 set. I love that these alphas are in a more formal font style, but still have their own character. I primed with gesso and then applied two coats of acrylic paint in a navy blue. Soo, I have a little confession to make... I'm a massive fan of metallics and bling! I can't tell you how happy it makes me that the gold metallics have continued to be so popular with the latest collections being released. The Solstice collection from Pink Paislee is no exception, and I wanted to mirror the pops of gold in some of my chippy pieces. I've inked the pieces with Versamark ink and then heat embossed with Queens Gold embossing powder. The result is a really close match to the gold elements in the collection. I've tucked the Small Star Wheel behind my photo. The star wheels have a removable inner star (making it super easy to colour the inner star differently), and then some extra smaller stars in the set to layer. The Stars in a Row are so versatile. On this layout I've made a border strip by joining a few rows together, and I've trimmed a strip of three stars which have been positioned above my title. 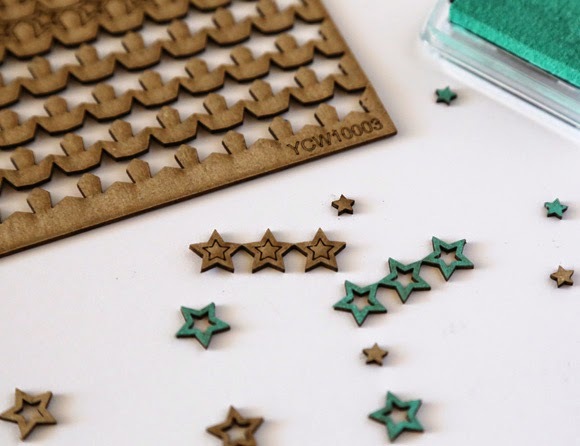 You can also cut them into individual stars for scattering around your page, and the inner star in the centre of each one is removable, so you can have outline stars and small stars as well! 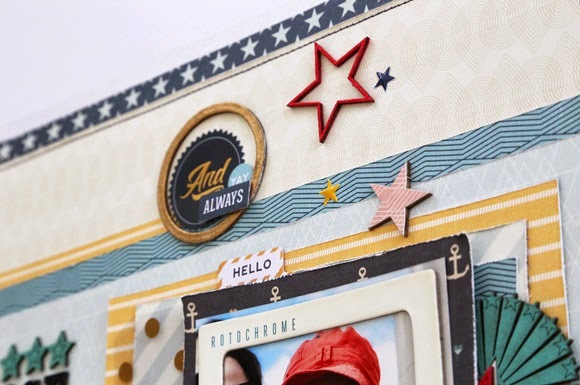 Included in the pack with the Your a Star badge, are two layered stars within circles. I've pulled each of these apart so that I have two outline circles and four larger stars to scatter about the page. I've used some more navy acrylic paint, gold and red embossing powders, and patterned paper to colour the stars and circles. A few pieces of ephemera from the collection, some October Afternoon Pop Drops and some journalling, and I called it done. 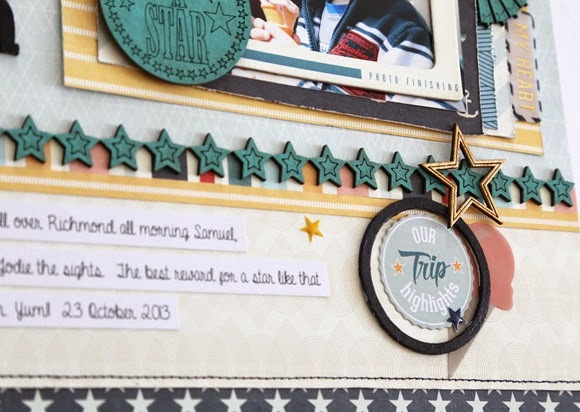 Your Creative Wings materials used: Star Border YCW10003, Word Discs - So Proud Combo YCW1023, Small Star Wheel YCW10006, Alpha Set #1 YCW 5006. Other materials used: Pink Paislee-Solstace patterned paper, Crate Paper-The Pier slide frames, Pink Paislee-Solstace ephemera, October Afternoon-Daily Flash pop drops, Colour Box pigment ink in Mint, Ranger embossing powder in Queens Gold, red embossing powder, acrylic paint, machine stitching. 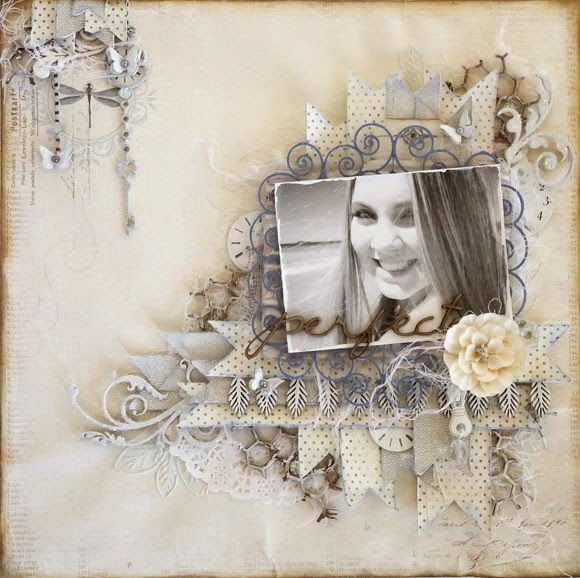 My second layout is a softer coloured shabby page using a lot of textures and layers. 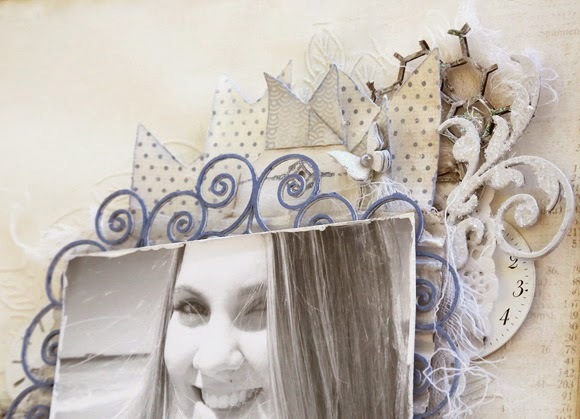 I've used papers from Pion Design's Shoreline Treasures collection. I've started my layers with some texture paste tinted with cream acrylic paint and applied to my background with a leaf stencil. Once dry I've added some watercolour in a soft blue and allowed to dry again. From there I've layered strips of the papers trimmed into banners and added bits and pieces between the layers. I've applied two coats of gesso to the leaf border, and the flourishes have had two coats of gesso, followed by matt Mod Podge as a glue with a light dusting of Diamond Dust for some glimmer. The chicken wire background I wanted to grunge up a little, so I trimmed four or five odd sized shapes out of the sheet, spritzed each of them with water to allow them to loosen up, then manipulated them a bit to pull them out of shape. Then using my scalpel (carefully ha!) I scratched across the top layer to loosen fibres here and there. Once dry I added gesso randomly and finally added some Kindyglitz for sparkle. My frame originally had a square outside border attached, but that's the beauty of working with a raw product - you can change it up so that it suits how you want to use it. I carefully cut away the outside border with scissors and was left with just the scroll frame. I primed this in gesso and then applied a blue pigment ink. The brand new range of script words are beautiful. I've used the word "Perfect", but others available include Happiness, Laughter, Memories and Wanderlust. This scripty font is really on trend right now. 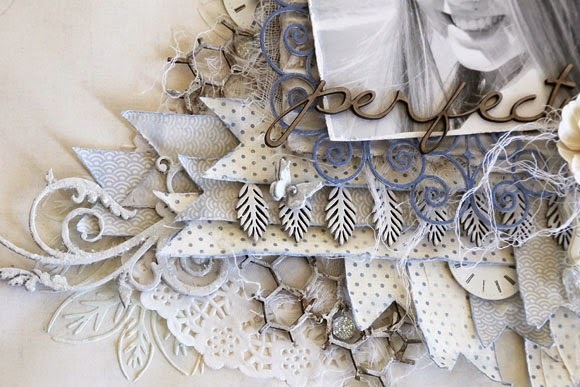 I've left my title piece raw as a contrast against the lighter colours in the papers and embellishments. 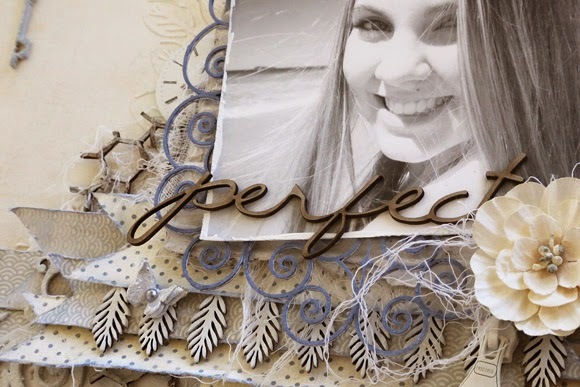 Your Creative Wings materials used: Perfect Day Script Set YCW1052, Leaf Border YCW 11006, Key to My Heart Charm Set YCW12013, Butterflies Mini YCW3042, Mesh Panel YCW8010, Scroll Frame YCW6013, Sprig Set 2 YCW7013. Other materials used: Pion Designs-Shoreline Treasures patterned paper, The Crafters Workshop 6x6 Mini Leaf Frame stencil, Prima Junkyard Findings clock faces & zippers, Prima Say it in Crystals, doilies, Petaloo flower, corrugated cardboard, Kaisercraft Jewels in Hunt & Gather, Twinklets Diamond Dust, Kindyglitz in Crystalina, Windsor & Newton Iridescent Medium, Tattered Angels Glimmermist in Glacier, Versa Colour Ink in Atlantic & Baby Blue, Distress Ink in Frayed Burlap and Pumice Stone, watercolours, muslin, gesso, texture paste, Jo Sonja's Crackle Medium. Hi there and welcome to my blog. 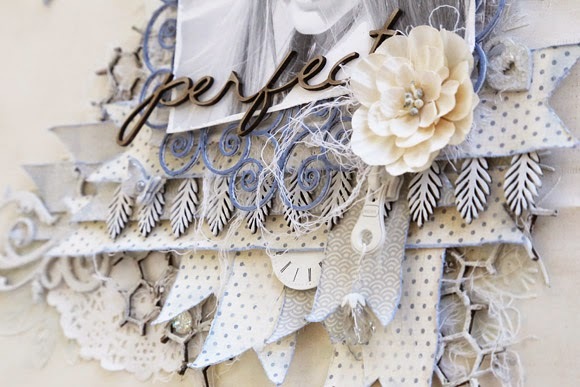 This is where I get to indulge in and share my love of all things papery and pretty. 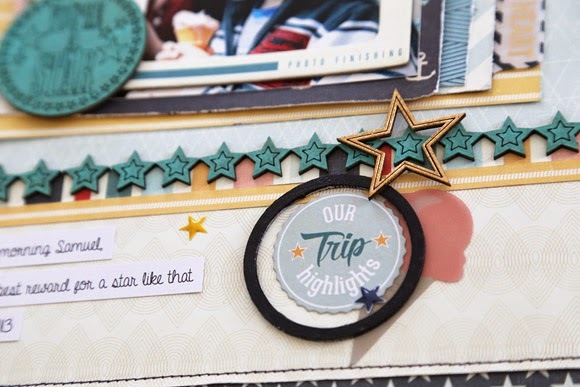 I love scrapbooking, cardmaking and project life and can't let a day pass without getting crafty. I live in sunny Queensland and share my life with my DH of 20 years and teenage DD and DS.